Debido a restricciones por parte del fabricante no podemos enviarle este artículo. MuscleAidTape products to the European Union. "I love the colour and its stay in place well"
"Like it ....... good price .."
The wave-patterned adhesive design of MuscleAidTape™ allows it to have the same flexibility as human muscles, so it offers a gentle yet effective way to re-educate the neuromuscular system, improve blood circulation, and relieve pain by providing comfort and stability to your body. MuscleAidTape™ provides excellent air permeability to let your skin breathe while letting sweat evaporate. It is also water resistant, so it securely adheres to your skin, through showers and water activities (including salt water), making it the perfect aid for all athletes including water sports and triathletes. 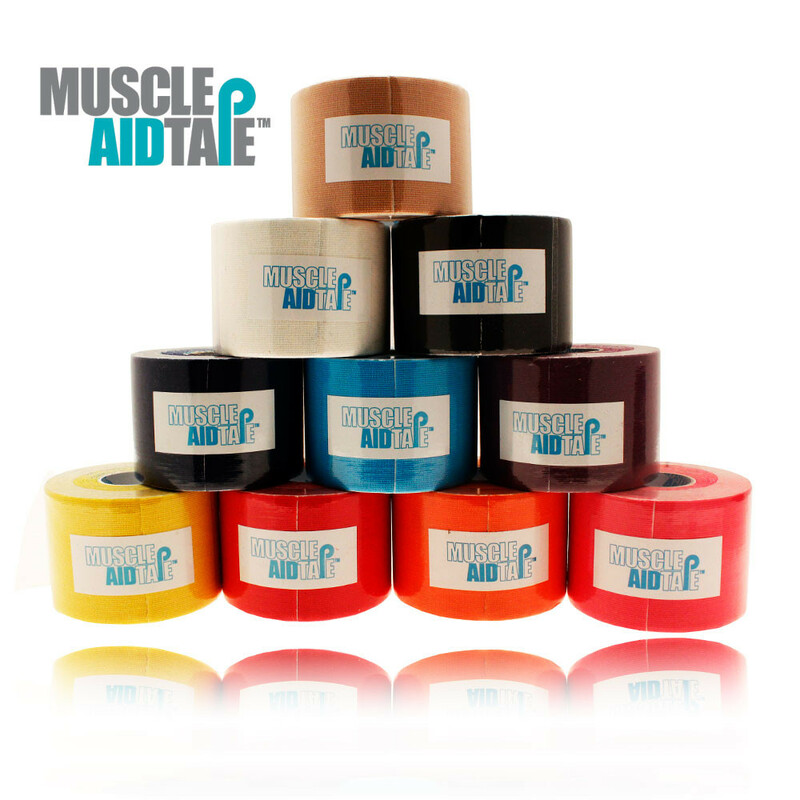 MuscleAidTape™ is one of the thinnest and lightest kinesiology tapes on the market, it is also non-pre-cut which means is can be cut to desired lengths without waste and use longer strips for maximum effectiveness for areas like the hip flexor. It is also the only tape that survives extreme workouts such as hours of open-water swimming, surfing, and triathlons. How does MuscleAidTape actually work? Over worked or injured muscles are usually inflamed, which causes it to push up and block the blood circulating between the upper muscle and skin layer, leading to pain. After stretching MuscleAidTape and applying it, the tape will want to contract so it lifts up the skin with it creating space for more blood to flow through. New blood supplies more oxygen to help with pain relief, soreness, cramping, sprains and other injuries. Round the edges of the tape after cutting to stop the tape snagging against clothing. Apply to clean, dry skin. (Be aware taping to hair, will reduce the adhesivitity. It is recommended to trim areas of body with longer hair - legs/ chest for men. Always stretch the tape a you apply it and follow the muscle path. Try to have skin stretched before you apply MuscleAidTape (E.g. For knee pain, have the knee at a 90 degree angle when taping). Stretch MuscleAidTape more for younger and more athletic users. Stretch MuscleAidTape more for more severe pain. 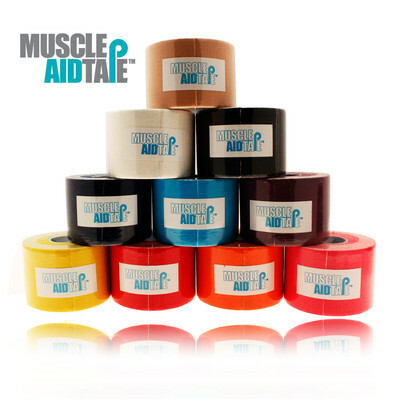 MuscleAidTape is recommended for 3 days wear, but can be kept on for up to 5 days. Excellent air permeability - Let's skin breathe and sweat evaporate. Non-precut - Cut to desired lengths without waste. Unique adhesive solution - Allows for easier backing paper removal and leaves no glue residue on skin. See below for instructional videos on how to apply to: Quad, hamstrings, shin, knee, calf, lower back, plantar fascia and achilles.